Advantages: Respectable contributors, diverse range of subjects, excellent artwork, and plenty of scale drawingsVaried subject matter, knowledgeable contributors, superb artwork, and excellent scale drawings. Conclusion: An excellent all round publication for the WWI airplane enthusiast, with extra space devoted to in depth kit reviews. 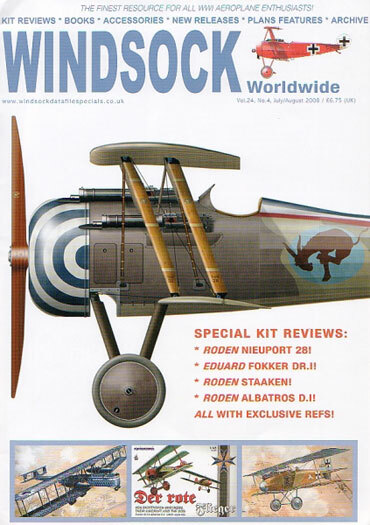 This latest issue of Windsock Worldwide sees a bit of departure from previous copies. Due to the recent landmark releases from a number of manufacturers, the usual “kit review” section has been expanded into an “in depth” study. This is excellent news as the enlarged format allows more detailed information to be passed on to the reader. Roden’s 1/32 scale Albatros D.I is first up and as well as the familiar discussion about the kit itself, we are treated to an insight regarding the mount of Prince Friedrich. This is backed with appropriate photographs and makes for very interesting reading. Eduard’s much talked about Fokker Dr.I comes under the spotlight and once again it’s accompanied by period images. There are various close-ups presented which help point out some of the salient features of this aircraft. These prove to be of immense value for those planning to enhance the detail already found on the kit. Contemporary colour images of the preserved Staaken R.VI nacelle will help those building Roden’s latest incarnation of this giant. The 1/72 Aviatik-built R.VI (Av) 52/17 comes under scrutiny this time and is followed by the 1/32 Nieuport 28 from the same manufacturer. For the latter, there are reproductions of structural and schematic drawings and a couple of superb colour profiles by Ronny Bar. They are based on the research of Alan D Toelle so a very high standard of accuracy is assured. Les Rogers continues his analysis of RE8 squadrons with part 6 of the series. There are 11 photographs that cover machines from No.59 Squadron RFC/RAF and No.67 Squadron RFC/No.1 AFC. The article is ably assisted by the artwork of Bob Pearson which depicts 3 interesting aircraft. Number 15 in the series on Austro-Hungarian Naval aeroplanes is the Mickl type G. This is part 1 of a 2 part feature and contains the author’s usual general arrangement drawings in 1:72 scale. There is an excellent selection of black and white photographs, and once again Bob Pearson supplies the inspiring artwork. For those wanting an all round appreciation of the early war birds, this publication won’t let you down. The authors are specialists in their field and are only too happy to pass on their knowledge. As well as the above, there are the regular sections devoted to book and accessory reviews, a reader’s gallery and a letters to the editor section. So there we have it, another interesting issue that is sure to contain something to please even the most fastidious WWI aviation enthusiast.